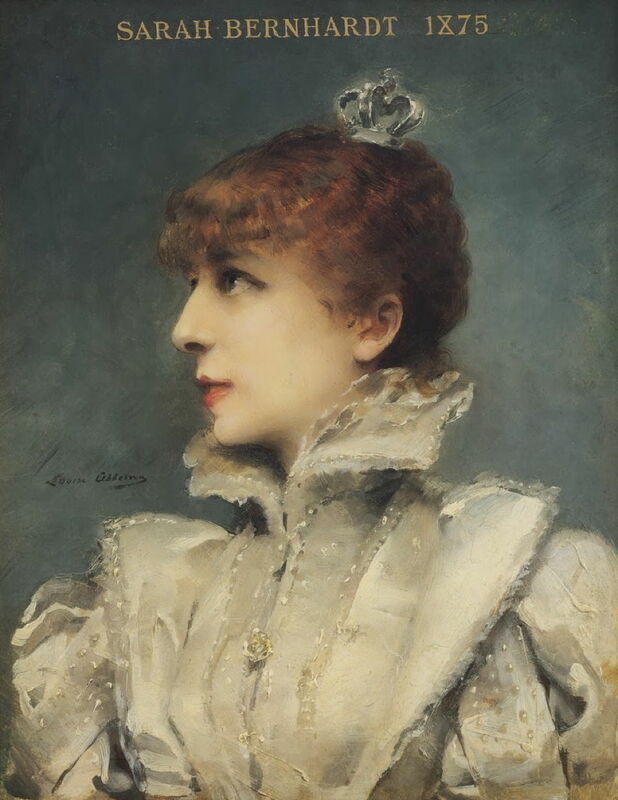 Georges Clairin (1843–1919), Sarah Bernhardt (c 1900), further details not known. Wikimedia Commons. The most famous motif of Georges Clairin (1843–1919) was his friend of fifty years, the superstar Sarah Bernhardt (1844-1923). She was one of the first such superstars in the era in which international celebrities started to appear. Born to an unmarried courtesan in Paris, she was brought up by a nurse in Brittany, then in a suburb of Paris. Her mother’s success in her trade secured the financial backing for Sarah to be educated at a top school for girls, and she was introduced to the theatre in the hope that she would pursue a career as an actress. She studied at the Paris Conservatory from 1860, and made her debut on stage at the Comédie-Française in 1862. After a stormy start, she had an affair with a young Belgian noble, and at the end of 1864 gave birth to their son. Her career progressed better during her time at the Odéon from 1866, and two years later she had a string of successful roles, making her a rising star. 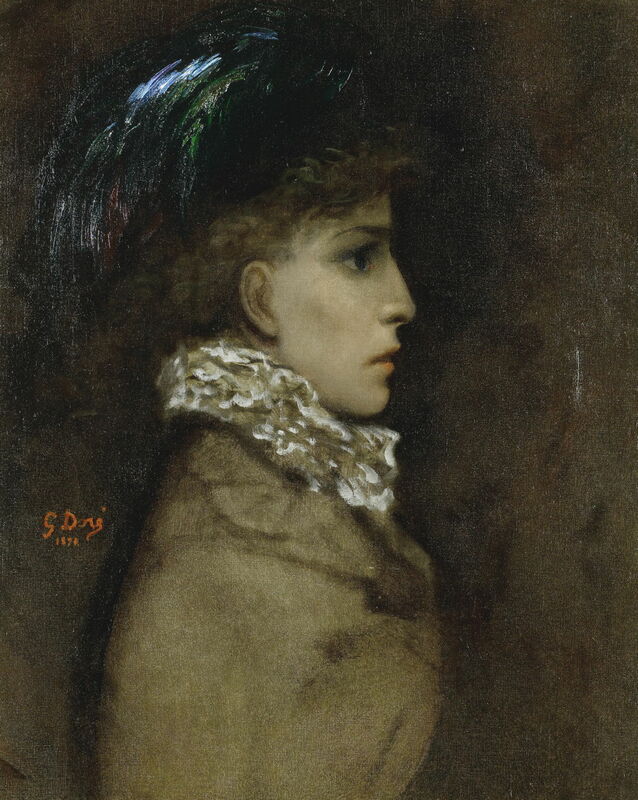 Gustave Doré (1832–1883), Portrait of Sarah Bernhardt (1870), oil on canvas, 65.5 × 54 cm, location not known. Wikimedia Commons. This first portrait of her was painted by her friend Gustave Doré (1832–1883) in 1870, probably when they were both trapped in the siege of Paris, in the Franco-Prussian War. When the Odéon re-opened the following year, Bernhardt took the lead for a very successful run. On the opening night, Victor Hugo, the author of the play, knelt and kissed her hand. Georges Clairin (1843–1919), Sarah Bernhardt (1871), further details not known. Wikimedia Commons. It must have been at about this time that she met and befriended Georges Clairin (1843–1919), and he painted this (probably) first portrait of her. It demonstrates his fascination for clothing and costume, with which he fills his canvas. 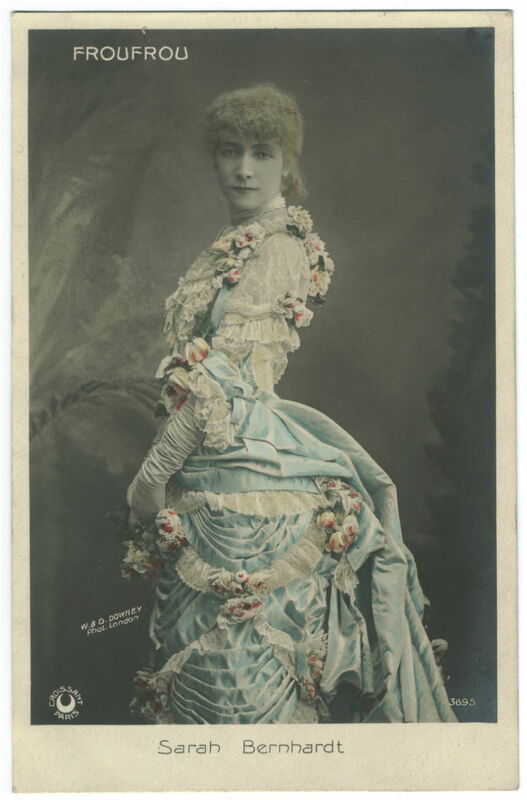 Bernhardt was lured back to the Comédie-Française in the autumn of 1872, where she established her reputation as the leading woman actor in France. It was at about this time that she became close friends, and possibly the lover, of the young painter Louise Abbéma (1853–1927). 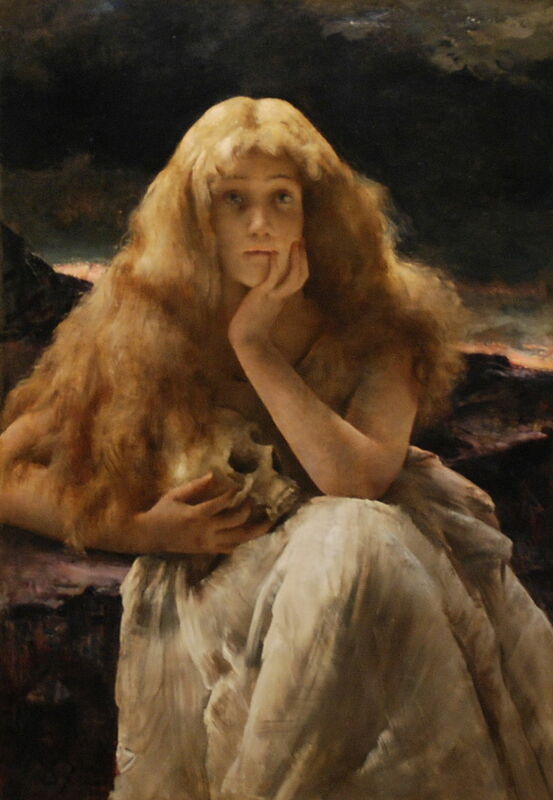 Louise Abbéma (1853–1927), Sarah Bernhardt (1875), further details not known. Wikimedia Commons. Abbéma studied under Carolus-Duran among others, and this portrait of Bernhardt painted in 1875 brought her initial recognition. 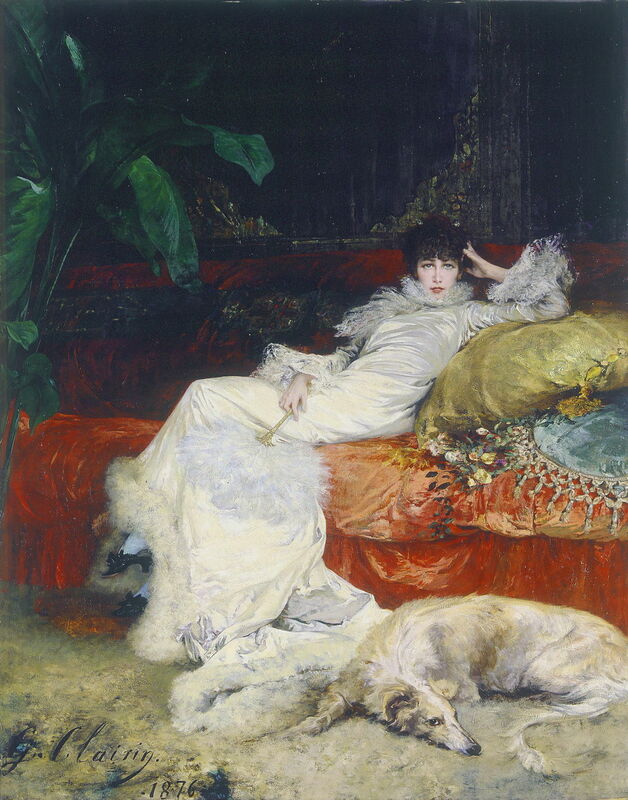 Georges Clairin (1843–1919), Portrait of Sarah Bernhardt (1876), media and dimensions not known, Petit Palais, Paris. Wikimedia Commons. 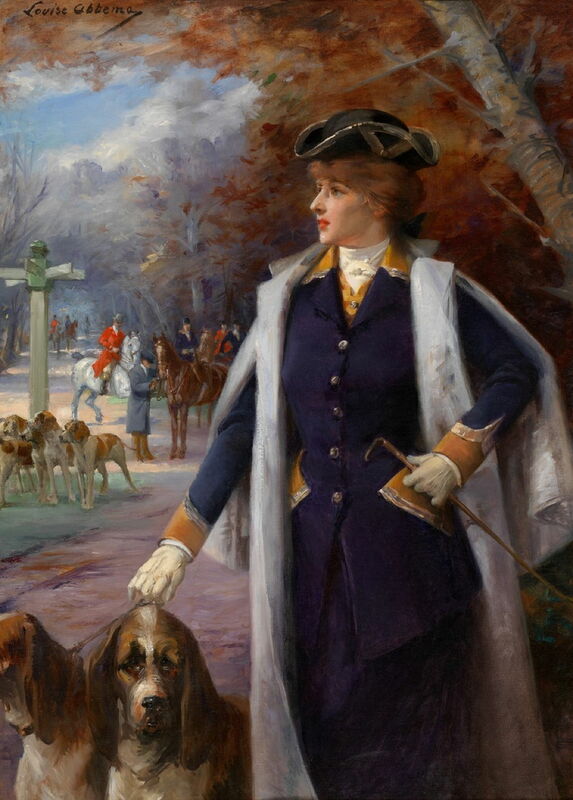 The following year, Clairin painted this portrait, in which Bernhardt’s dog complements her gown. Jules Bastien-Lepage (1848–1884), Sarah Bernhardt (1878), oil on canvas, dimensions not known, Nationalmuseum, Stockholm. By Bjoertvedt, via Wikimedia Commons. Jules Bastien-Lepage (1848–1884) was just establishing a successful line in portraiture at the time, and in 1878 painted this vigorously-brushed sketch in oils. His finished work, below, shows Bernhardt contemplating a small sculpture, and brought Bastien-Lepage the Cross of the Legion of Honour. Jules Bastien-Lepage (1848–1884), Portrait of Sarah Bernhardt (1879), oil on canvas, 109.7 x 82 cm, Fine Arts Museums of San Francisco, San Francisco, CA. Wikimedia Commons. Bernhardt remained close to both Clairin and Abbéma. During the 1878 Exposition Universelle in Paris, the balloonist Pierre Giffard and Georges Clairin took her for a flight in one of Giffard’s balloons. They were blown far out of the city by gusty winds, and had to return by train, which incurred the wrath of the theatre management. In 1879, while the Comédie-Française was closed for redecoration, she made her first overseas tour to give private performances in London. 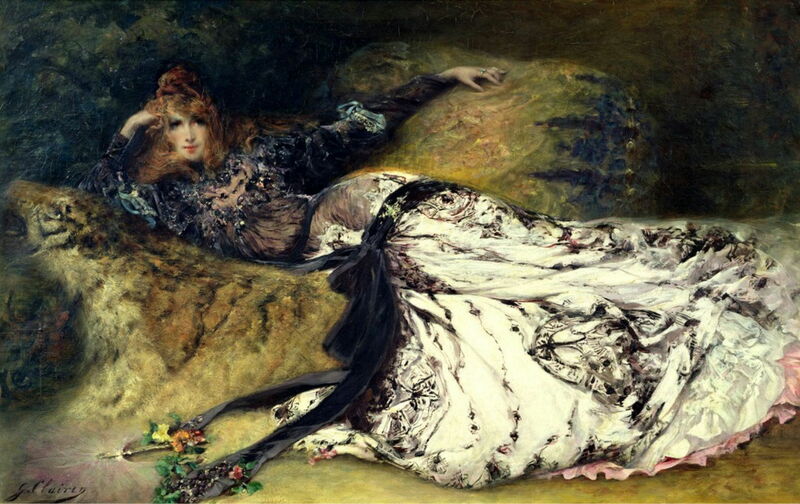 Giovanni Boldini (1842–1931), Portrait of Sarah Bernhardt (c 1880), further details not known. Wikimedia Commons. 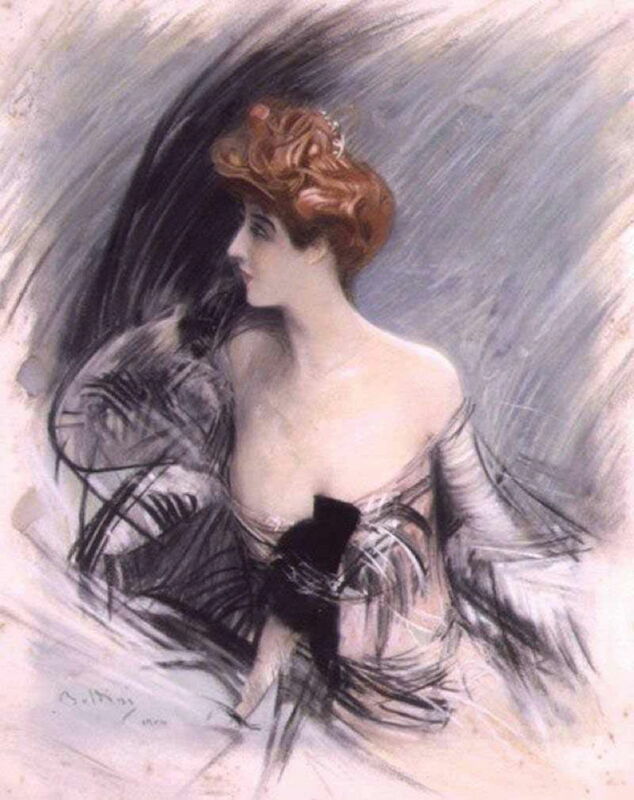 This portrait by Giovanni Boldini (1842–1931) is thought to be of Sarah Bernhardt, and was painted around 1880, when she left France and the Comédie-Française for her first public tour of Britain, then on to the US. During that first American tour, made from a special luxurious train, she completed 157 performances in 51 cities. She returned to Paris in May 1881 with a chest of gold coins, worth nearly $200,000, in payment for her performances. Hans Makart (1840–1884), Sarah Bernhardt (1881), media and dimensions not known, Salzburg Museum, Salzburg, Austria. Wikimedia Commons. 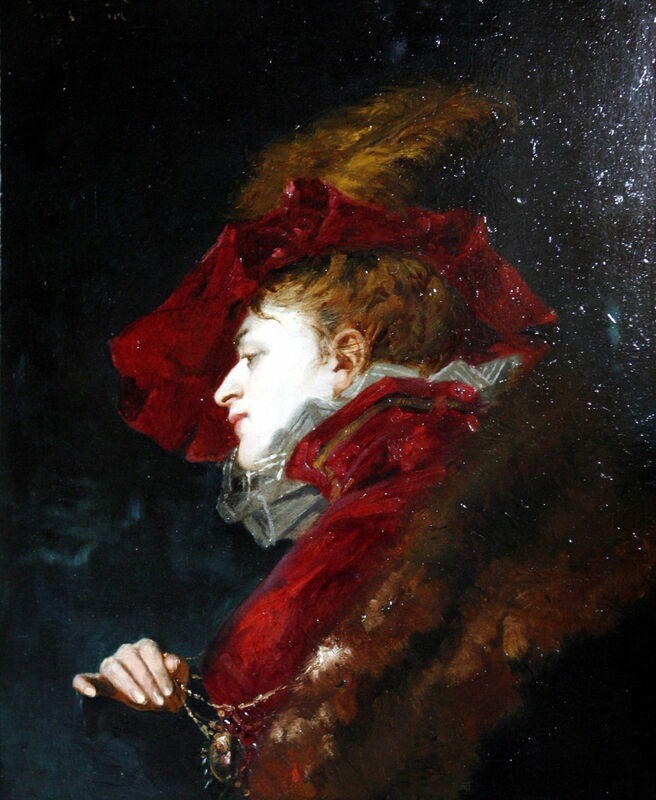 Hans Makart (1840–1884) painted her looking very thin and gaunt, on her return to Europe. There she gave a private performance of her signature play La Dame aux Camelias to Queen Victoria, then on the fourteenth of July received a standing ovation for reciting the Marseillaise in front of the President of France. William and Daniel Downey (1829-1915, 1831-1881), Sarah Bernhardt, Froufrou (c 1882), photograph, further details not known. Wikimedia Commons. Just before she began a tour of Europe and Russia, she married her leading man, Jacques Damala, although that lasted less than a year. At about this time, the brothers William and Daniel Downey took this photograph of her in the lead role of Froufrou, as painted by Georges Clairin (see previous article). 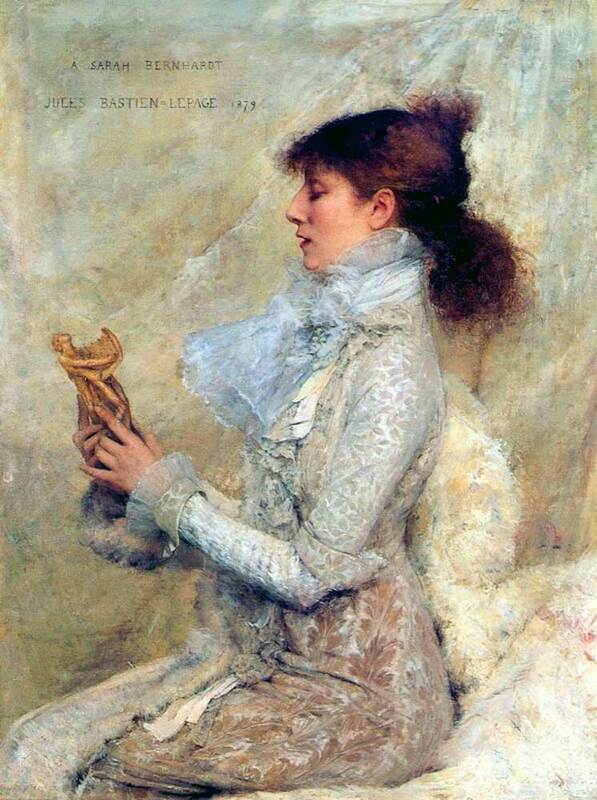 Léon Lucien Goupil (1834–1890), Portrait of Sarah Bernhardt (date not known), oil on panel, Musée des Beaux-Arts de Dijon, Dijon, France. Image by Rama, via Wikimedia Commons. Léon Lucien Goupil (1834–1890) painted this portrait of her at about this time too. Bernhardt undertook a fifteen-month world tour in 1886-87, from Brazil to Scotland, which earned her more than a million francs. In 1886, she fell in love with Belle-Île, an island off the southern coast of Brittany, and bought a ruined fortress which she had converted into her holiday home. She also had bungalows built there for her son and his family, and her close friends Georges Clairin and Louise Abbéma. Bernhardt had apparently been an enthusiastic painter and sculptor since her early days at the Comédie-Française, possibly influenced and aided by her friends Clairin and Abbéma. 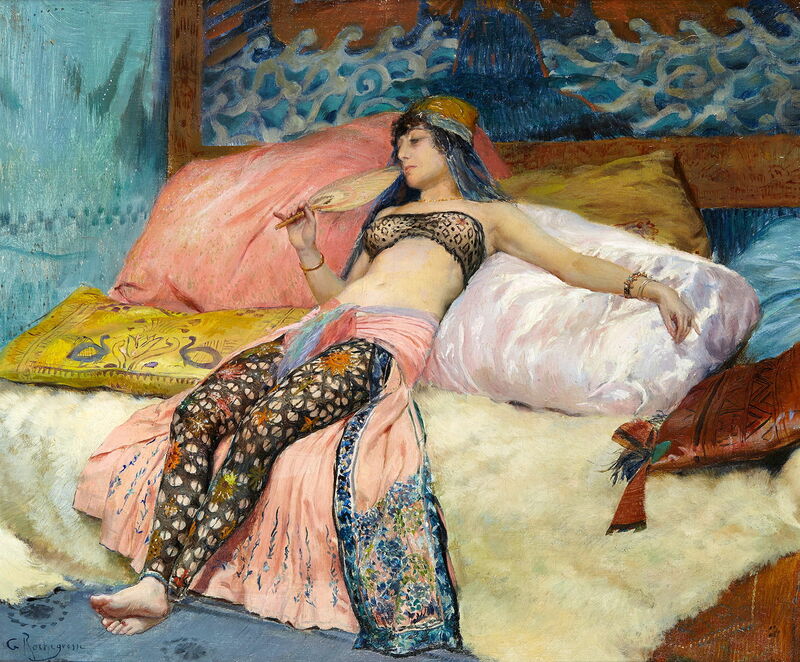 She exhibited a high-relief plaque at the Salon in Paris in 1876, and a painting in 1878. In 1887, she met the Belgian artist Alfred Stevens, who not only painted her, but took her on as a private student. This painting was commissioned of Stevens by the Paris dealer Georges Petit, and shocked the public when it was first exhibited. I am sure that it enhanced both Stevens’ and Bernhardt’s popularity as a result. 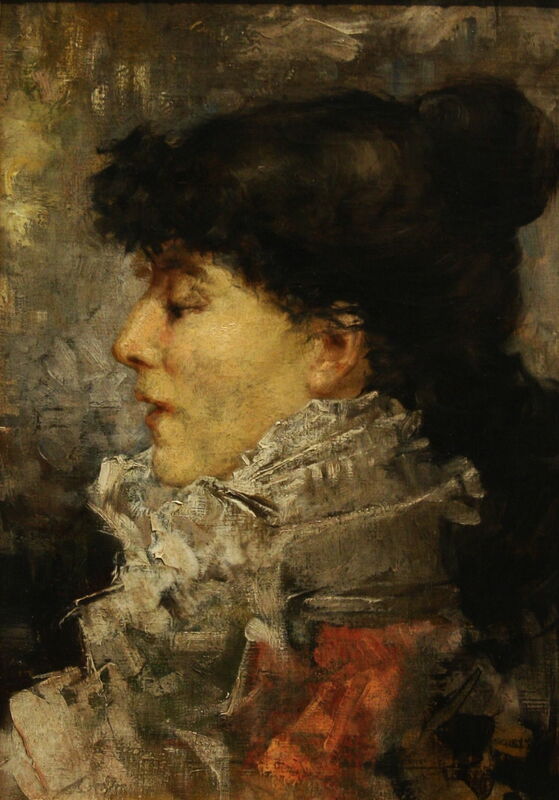 Georges Rochegrosse (1859–1938), Portrait of Sarah Bernhardt (date not known), oil, 50.5 x 61 cm, location not known. Wikimedia Commons. What was probably the earlier of two portraits of her by Georges Rochegrosse (1859–1938) was painted at about this time. Bernhardt continued to undertake periodic tours to top up her finances. In 1891-92, she returned with 3.5 million francs, but had injured a knee when she jumped off a parapet in Rome. This substantial fortune enabled her to buy her own theatre in Paris, and in 1894 she commissioned Alphonse Mucha to design posters for its productions. 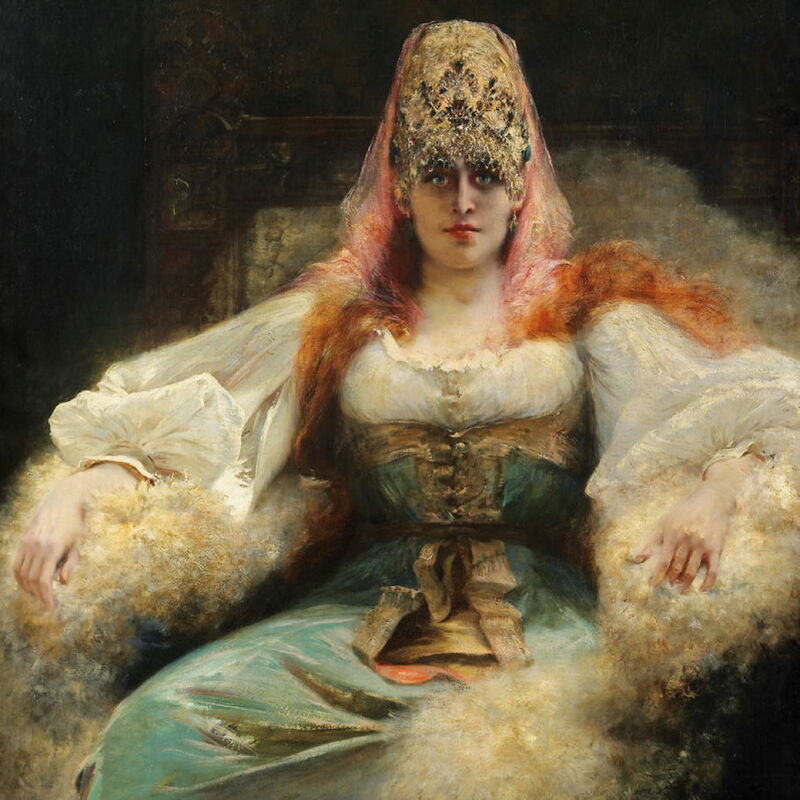 Franz von Lenbach (1836–1904), Portrait of Sarah Bernhardt, as Lady Macbeth (1892), oil on cardboard, 88.9 × 75.2 cm, Private collection. Wikimedia Commons. 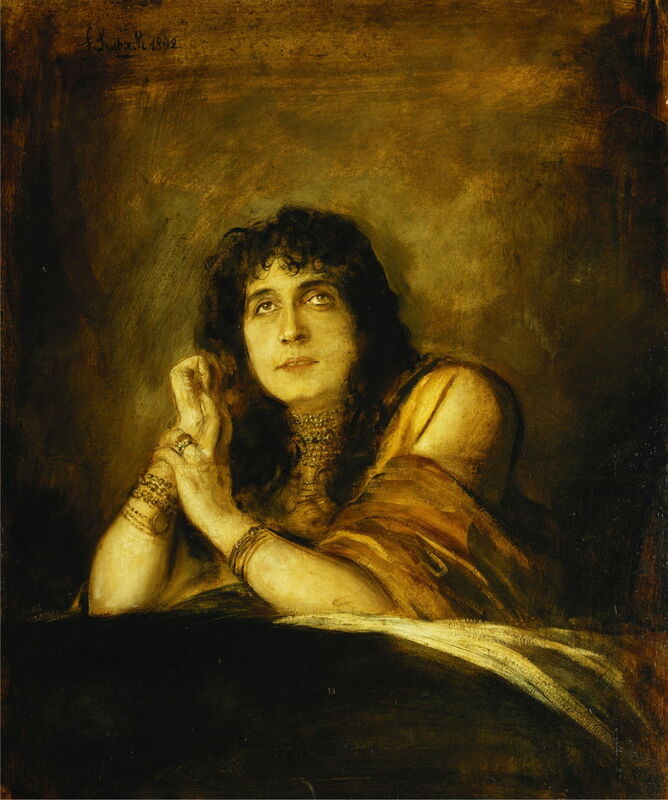 Franz von Lenbach (1836–1904) painted Bernhardt in her role as Lady Macbeth in 1892. 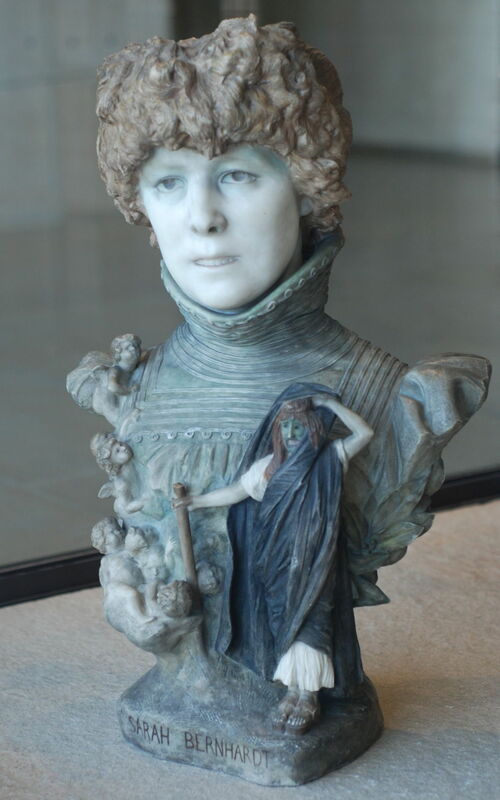 Jean-Léon Gérôme (1824–1904), Sarah Bernhardt (1894-1901), polychrome marble, Musée d’Orsay, Paris. Wikimedia Commons. In 1894, Jean-Léon Gérôme started work on this polychrome marble head of the actor, which he completed in 1901. He bequeathed it to the French nation. Louise Abbéma (1853-1927), Sarah Bernhardt (date not known), further details not known. Wikimedia Commons. Louise Abbéma painted this portrait of Bernhardt at around this time, providing one of the few insights into her life away from the stage. Georges Rochegrosse (1859–1938), Portrait of Sarah Bernhardt (c 1900), further details not known. Wikimedia Commons. By about 1900, Bernhardt had moved to a larger theatre, and Mucha’s work had expanded to include set, costumes and prop design. Georges Rochegrosse painted this second portrait of her showing the style of Japonism(e) which was popular at the time, with masks at the left edge, and Bernhardt’s dress based on a kimono. 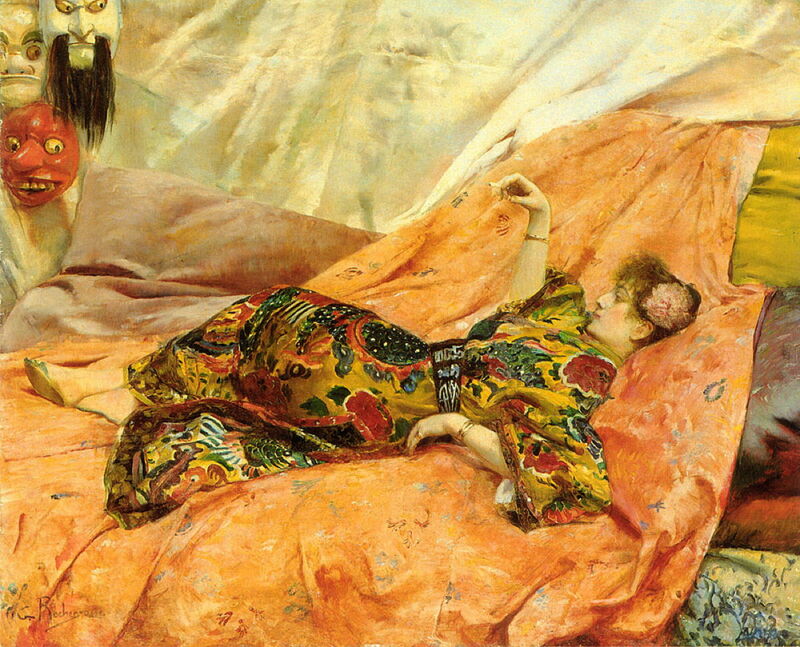 Her friend Georges Clairin continued to paint Sarah Bernhardt during her later career. This portrait from around 1900 sets a slightly larger bust within another of his essays in fabrics and textures. At this time, her old knee injury started to cause her serious problems, and from 1905 she made the first of several ‘farewell’ tours overseas. Georges Clairin (1843–1919), Sarah Bernhardt in Theodora (1902), further details not known. Wikimedia Commons. 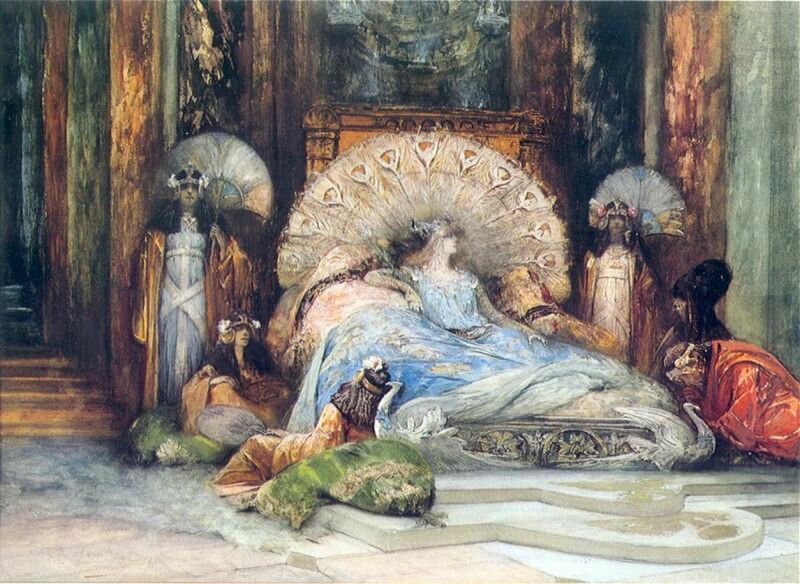 Clairin’s painting of 1902 shows her in the role of Theodora, which appears to have accommodated her knee problems better than her earlier parts. 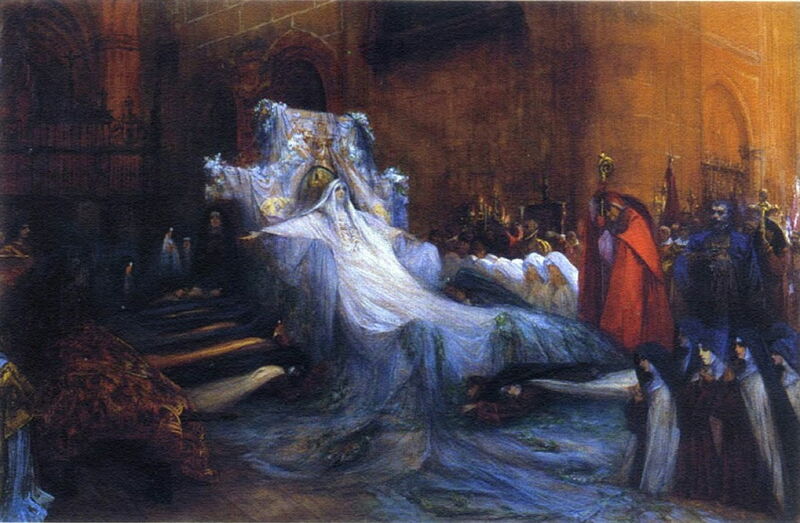 Georges Clairin (1843–1919), Sarah Bernhardt in Sainte Therese d’Avila (c 1906), further details not known. Wikimedia Commons. The last of Clairin’s portraits that I have found shows her as Sainte Therese d’Avila in about 1906. Bernhardt was at her home on Belle-Île when the First World War started, but developed gangrene in her injured leg, which had to be amputated. She returned to the stage to entertain the troops. Bernhardt worked, and acted, until she collapsed with kidney disease in 1922. She went into a coma, and died the following year. Although there are many, many photographs of her, including a large set by Nadar, who had been a friend to the Impressionists, they pale by comparison with this superb series of portraits. Most not just painted by fine artists, but by good friends. And Georges Clairin and Louise Abbéma couldn’t have wished for a more loyal patron and subject. Posted in General, Life, Painting and tagged Abbéma, Bastien-Lepage, Bernhardt, Boldini, Clairin, Doré, Gérôme, Goupil, Makart, painting, portrait, Rochegrosse, Stevens, von Lenbach. Bookmark the permalink. I have seen women wearing something like the outfit in the first Rochegrosse. I thought it was an awkward, but exclusively contemporary trend. I guess fashion goes in cycles. Who knew that leggings are old fashioned! Thank you. I have some of Mucha’s paintings coming in a future article, in the context of Klimt and the Vienna Secession. I would like to see included a portrait by Bottini and a poster by Mucha. This is a wonderful website.